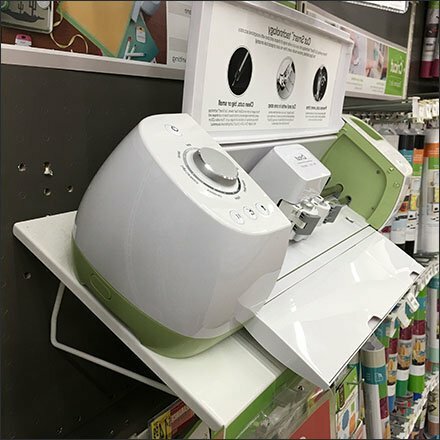 This Cricut Declined Shelf for Pegboard Display cants the merchandise down for better view of the intricate interior mechanism. An explanation of the inner workings and benefits is billboarded inside the top cover. Consider details of the Cricut Declined Shelf Pegboard Display in the gallery of images. Though untested by FixturesCloseUp, I suspect this Pegboard Mount Shelf would also perform as a Declined Pedestal Stand for table top. Seen at Michaels Stores.